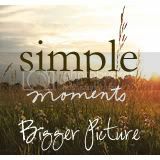 Welcome to Bigger Picture Moments! Taking time to revel in the simple moments that make up the bigger picture of our life! The link up can be found at Part I. As we wrap up our focus on love this month I thought it appropriate to finally share the story of the love of my life. It’s perfectly crazy hollywood style romantic comedy material, if I wanted to exgerate the fnny details. I won’t. It’s just an ordinary story of love, timing, and the amazing way God ensures we meet the people we need at the time (or times) we need them. Two years later, it was the summer between my sophomore and junior year of college. I hadn’t thought about the boy that drove me home even once. I was going about life working, playing and counting down the days until I could get back to college and out of my cramped house.I had just broken up with my boyfriend from college and was really not in the mood to deal with (rich) boys anymore. My best friend Alice* was having her own predicament. A former boyfriend, Leonard* was doing his best to woo her back. She was not interested, but she was also way to nice to just say no and walk away. Leonard and her had been friends for a really long time so I don’t blame her. On this particular summer night Leonard was trying to get her to come to a party at the Boy in the Blue VW’s house, I agreed to go with her. I went with a bit of a chip on my shoulder. I had just broken up with another (rich) preppy, do what I want, when I want it, get what I want, when I want it, boy and I assumed everyone who was at this party was the same based on the zip code. We arrived to a driveway full of boy racers and motorcycles so I decided to have some fun and leave early. I made my way to the backyard in full, exuberant, let’s have fun mode, even though I had little interest in being there. When I first arrived I noticed that there was one guy who looked a little more grunge (cool) than the rest with a goatee, a cigarette and an aura of cool. I gave him I sideways look, I was definitely interested but I was not about to go out of my way. At one point I wandered into the kitchen to help put some things together. There we’re two guys inside, a total modern day Laurel and Hardy. One tall, skinny, blonde the other short, stocky, dark Italian. They were both more then a bit inebriated and both were obviously trying to (unsuccessfully) seem like super cool guys. I started preparing some “drunk watermelon” and managed to convince both of them that I was a TV chef on our local PBS station. I laughed my way back outside to find the boy with the goatee. Backyard parties were not Alice’s scene and she was itching to get to the clubs and dance, I was itching to try to talk to the boy with the goatee but I couldn’t find him anywhere so we decided to leave. We said good by to Leonard and asked where they boy was, since it was his house we wanted to say good bye and thank you for having us because we are nothing if not polite and proper. Turns out he was on the front porch, with another girl. The history of this story is that she young. The boy insists she was older than Leonard and I continue to this day to tease him about Either way he was busy sucking face and all we got was an embarrassed wave when we left. The next day Alice called me, Leonard had called her because one of the boys from the party wanted a date with me. “Oh is it the boy with the goatee?” I ask a little too excitedly, my own excitement in my voice surprised me embarrassed me. No, she says it’s his brother. Now here is the Hollywood funny twist. I am terrible (TERRIBLE) at remembering peoples names and faces. I need to meet someone multiple times and make up things in my head to remember them, so after a short meeting at a party it’s unlikely I will remember anyone I meet. So the reality is that goatee boy’s brother was the tall (Laurel) guy in the Laurel and Hardy pair in the kitchen. In my mind he was the short (Hardy) of the pair. So despite Alice’s insistence that he was a super nice guy I declined, I was not interested in a short Italian, Tall and skinny was more my style. I went about the next few weeks of summer just doing my thing, wondering about that inreresting aloof boy with the goatee. Little did I know we would meet again in a few weeks. Love the title. Is love ever ordinary? !